The video isn't complete until you add end credits, the title of the video and other necessary text elements to your project. There are many different types of titles and which one you are going to use depends on the context of the project you are working on. Learning to create each and every type of title can be a daunting process that takes a lot of time to complete, so before you embark on the adventure of making titles for your videos make sure that you know exactly what kind of title you want to create. Adding titles to your project in Premiere Element isn't complicated, but you still have to know where to find these options and how to adjust the properties for different kinds of titles. 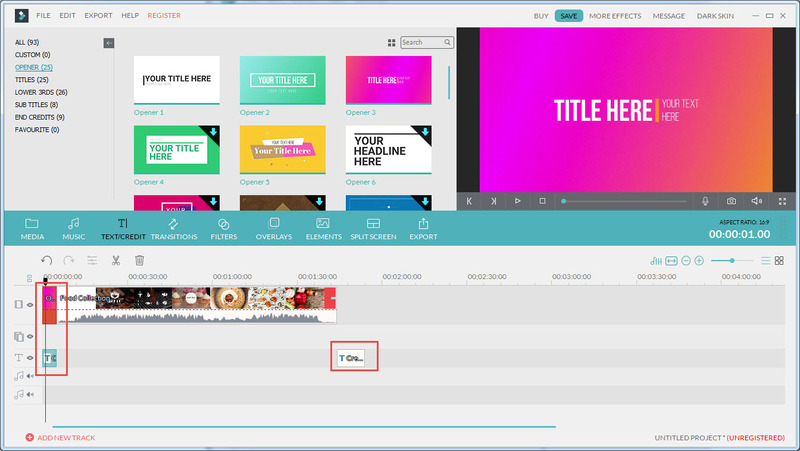 In this article, we will show you how to create titles in Adobe's video editing software. Premiere Elements is designed to help inexperienced editors to produce high-quality videos without having to know all the professional editing tricks. Despite this fact, adding titles to your videos requires a certain amount of knowledge about the video editing process. Let's have a look at how you can create different types of titles in this software. Motion titles are a fun and easy way to make your videos more interesting. If you would like to create this kind of title, all you need to do is click on the 'Titles and Text' icon on the 'Action' bar and select the 'Motion Titles' option from the drop-down menu. The submenu will offer you several different choices such as 'Contemporary' or 'Typography', click on the 'Show All' option to preview all 'Motion Titles' options. Once you have selected the effect that you like the most, simply drag and drop it onto the desired location on the timeline. Premiere Elements offers two different ways of creating still titles. You can either go to the 'Tools' menu and select the 'New Text option. In the sub-menu, you will be able to see the 'Default Text' feature, click on it to add it to your project and then proceed to enter the text you want. Alternatively, you can click on the 'Titles and Text' icon on the 'Action' bar and then select the 'Classic Titles' option that will enable you to add still titles to your project. Animating text in Premiere Elements is not too complicated. Before you can animate text, you need to make sure that you've added the title file onto the timeline. Once the title file is placed on the timeline, select it and click on the 'Adjust' tab. The window will appear on the screen and in your next step, you will have to click on the 'Animation' preset. If you want to preview an animation before applying it click on the play button on the animation icon, and if you want to apply the effect and save the changes you've made click on the 'Apply button. Rolling and crawling titles are so frequently used in movies, that they are the first association most people have when someone mentions titles. Go to 'Tools' and select the 'New Text' option, then select the 'Default Roll' or 'Default Crawl' feature. This action will automatically add the roll or crawl titles to the timeline. You can set the duration of the title by dragging its end, just keep in mind that the longer duration of the title will slow down the text featured in them. For more options double-click on the title file on the timeline, and adjust the settings according to your needs in the window that appears on the screen. Preset titles often contain elements that don't fit into your project. If you would like to modify the template you wish to use in your project here are the steps you will need to take. Click on the 'Titles and Text' icon on the 'Action' bar and select the template that you'd like to include in your project. Afterwards, you can just drag the template to the video track on the timeline, select it and make the changes you want in the 'Monitor' panel. Creating and adding titles in Premiere Elements may be too technical for a consumer level video editor. Fortunately, video editing software like Wondershare Filmora will enable you to add titles of all sorts and kinds to your projects without much effort. The software's text library provides numerous text effects, while users can also use more than one 'Text Tracks'. Filmora's 'Text/Credit' feature enables you to easily add 'Openers' and 'End Credits' to your projects that will make your videos look more professional. The Wondershare's video editing software provides numerous options to easily create titles for your videos and make professional-looking videos without wasting enormous amounts of time in the process. What’s more, in Filmora Effects Store, you can find more fashion and fabulous special effects, such as the TITLE EXPANSION SET and LOWER THIRD EXPANSION SET.